I can’t imagine a greater compliment than when someone says I have an inviting home. When I’m decorating my home, it is the first word that comes to mind when making the big decisions. 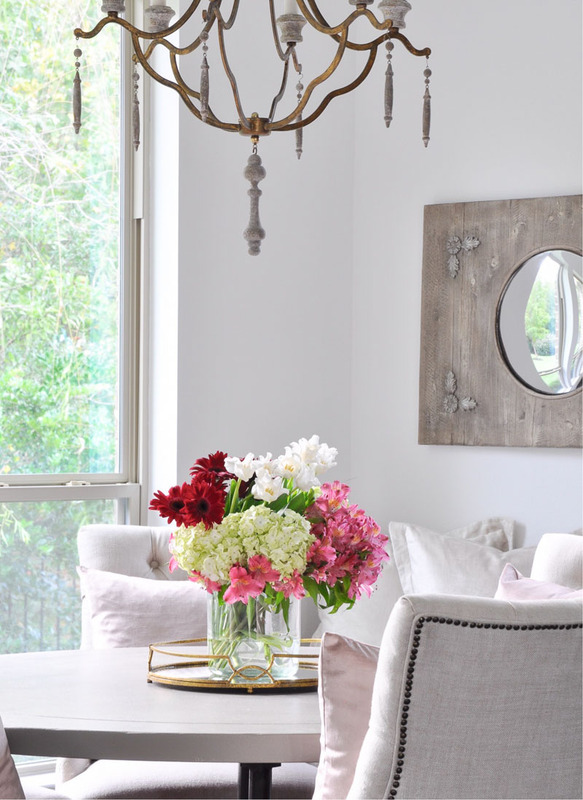 Having an inviting home will provide you with a sense of calm and make your guests feel relaxed. And this may come as a surprise, but it is an easy quality to achieve! 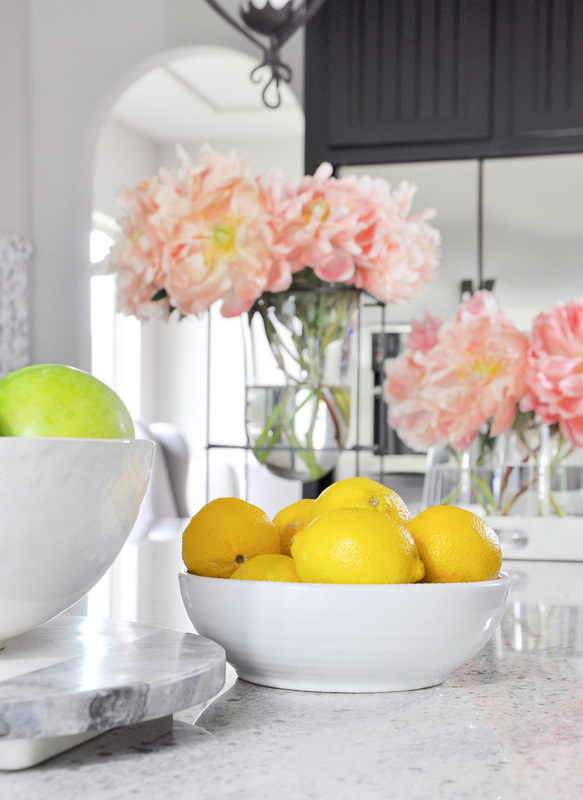 Follow my top 5 tips below and I know you’ll enjoy plenty of compliments on YOUR inviting home! Your entrance is the first impression of your home. 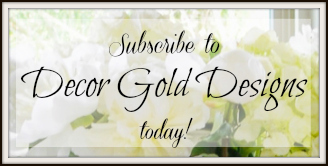 It is your chance to introduce the world to your decorating style. 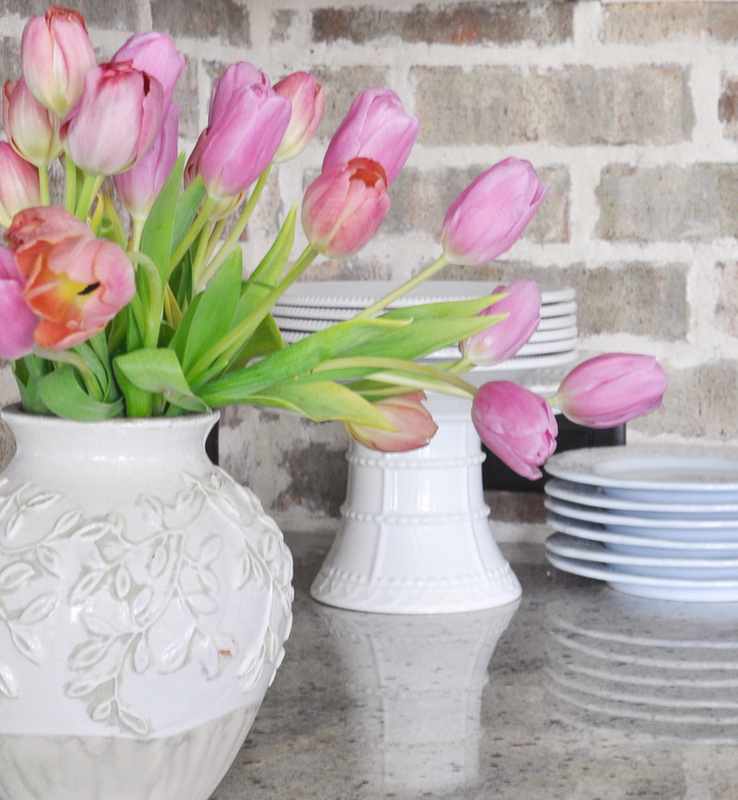 Make a memorable impression for your home by providing a glimpse into your aesthetic and leave them wanting more. Be sure to accessorize your entry hall for an inviting, finished look. 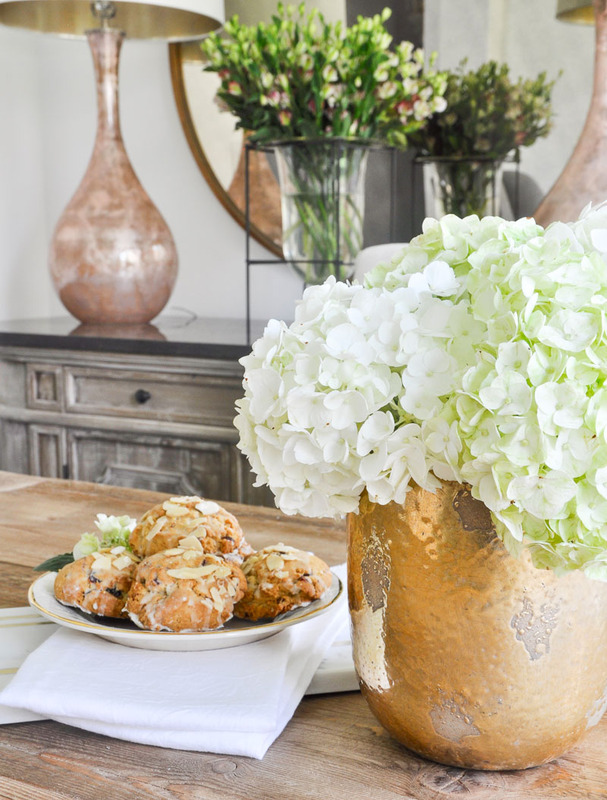 To add a sense of calm to any space, try using greenery, flowers or other natural elements. A flowering plant can last for a weeks. 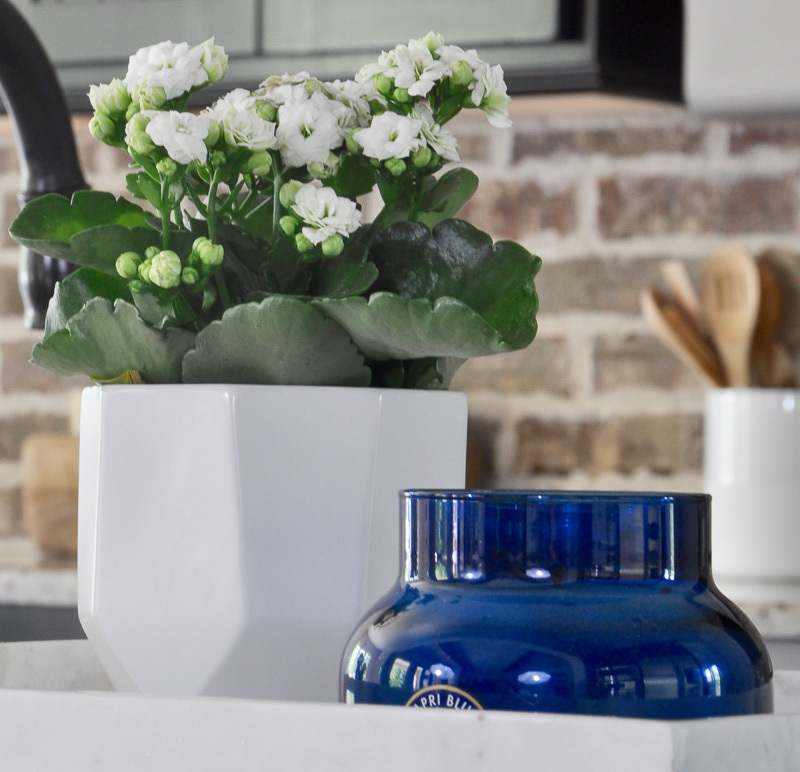 For this look, I spent $4 on this flowering plant at the grocery store and traded out the tin container it came in for this pot I already had. 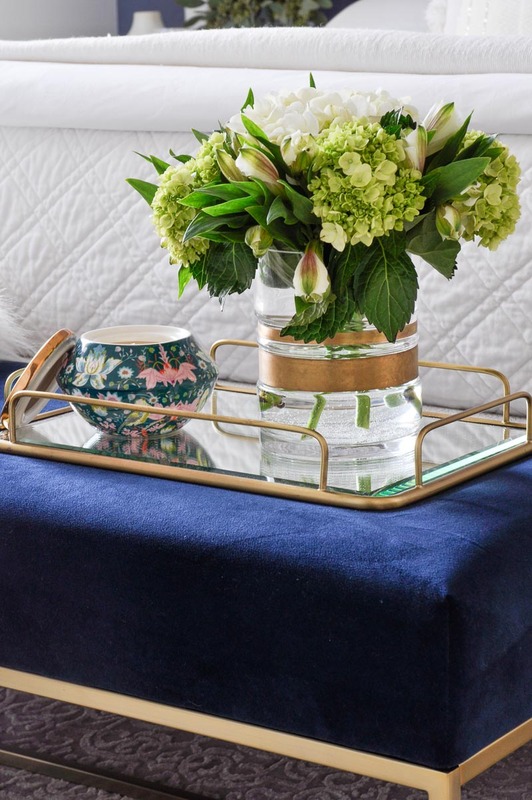 Add a candle and a tray for an easy vignette. 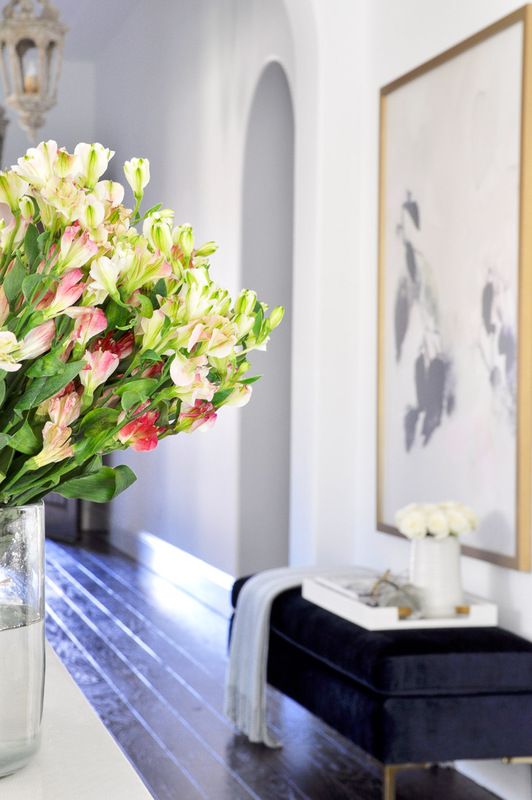 Fresh flowers are a quick fix for a plain room or space that otherwise lacks warmth. Especially if you layer them on a pretty gold tray. It’s nice to add a bit of fruit as well. You don’t have to arrange it perfectly, just set it out or add it to a classic white bowl. Flowers do a nice job of expressing the season as well. 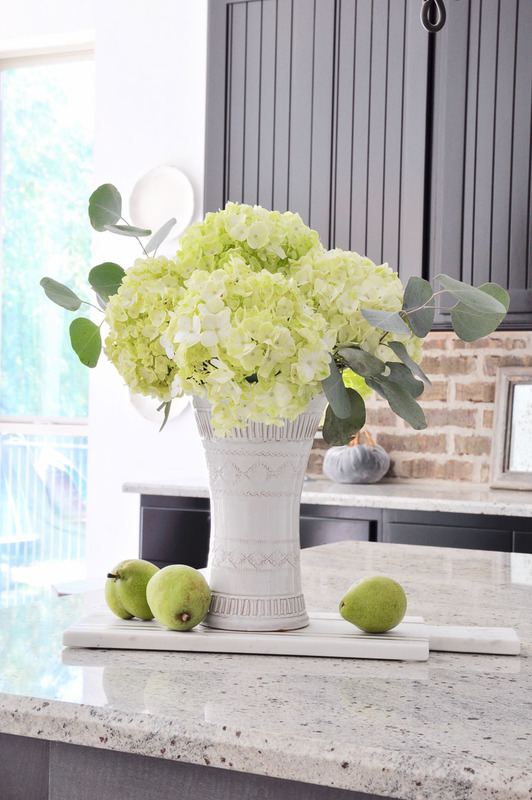 Subtle seasonal decor goes a long way towards the goal of giving your home an inviting feel. A bright home is an inviting home. The easiest route to brightness…..lots of white. White has never been more popular than it is today. While I do believe we will see more rich colors coming back on the scene this year, white will still dominate for most large surfaces. As a result, you will find numerous options to select from regardless of your style. Light is reflected by white, so it provides a lighter look beyond its own surface. You can see how the sun casts a warm glow on the white. Nothing provides a more welcoming energy than this! Our decision to paint most of our home white came last year. I could not be more thrilled with the results. Read about how we decided to take the plunge here. And here you can find the reveal. Lastly, my advice on how to choose the right white paint is linked here. Bedding is another way to add brightness to your home. Plus, you can go crazy with layering to get an extra inviting look! Keep easy snacks and food around for unexpected guests. 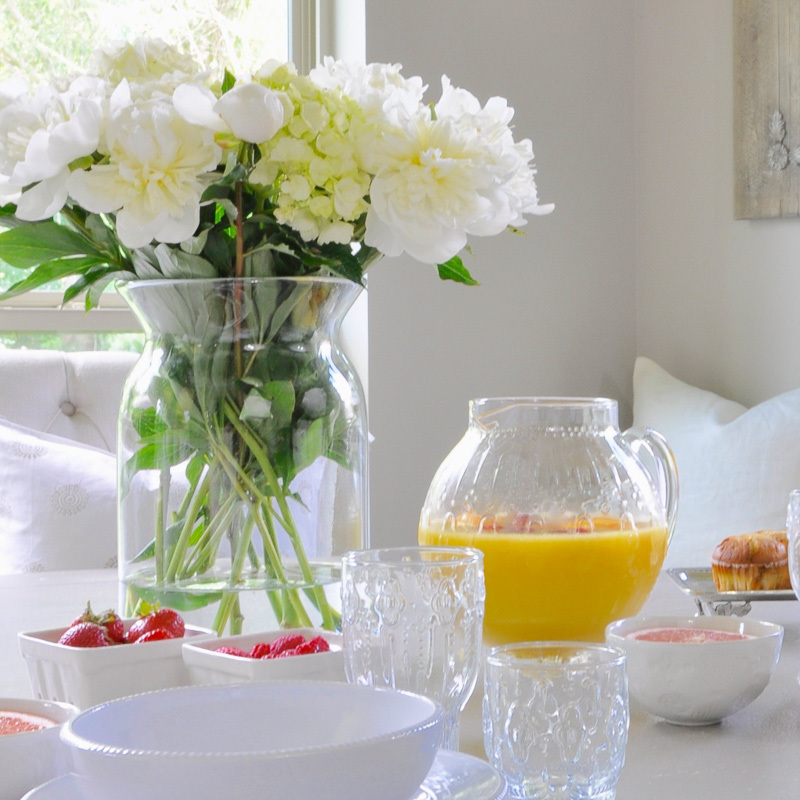 Being able to pull together a snack or a light meal is definitely the sign of a wonderful hostess. 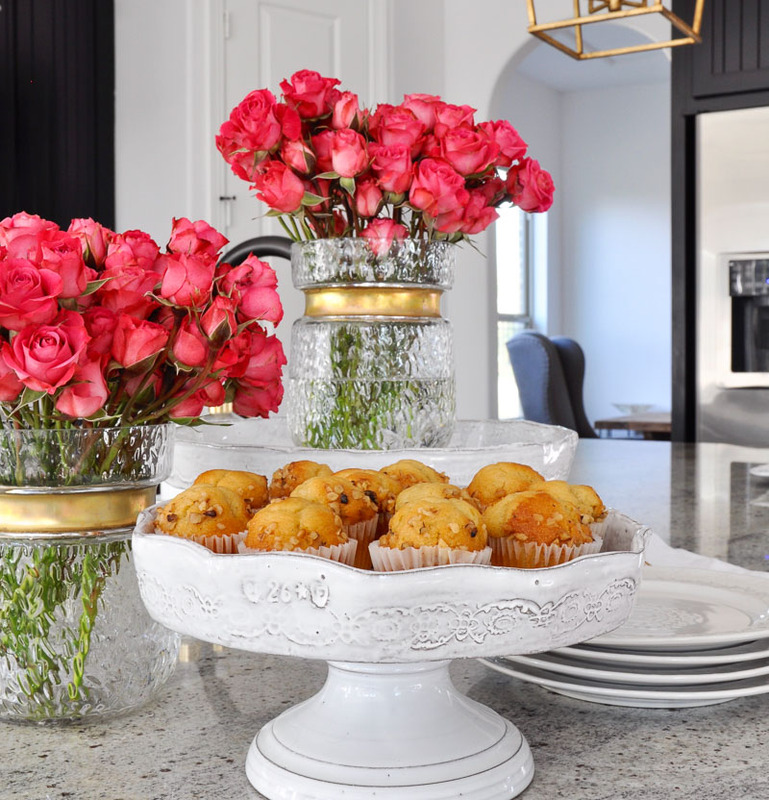 By putting it out in a complimentary setting you will make your home and everyone who enters it feel very happy and welcomed. Your guest are there to see YOU. Make sure your home reflects who you are! I used to purchase pieces for specific spots in my home. Now I simply buy things I love knowing that I’ll enjoy styling and restyling them over time in my home. 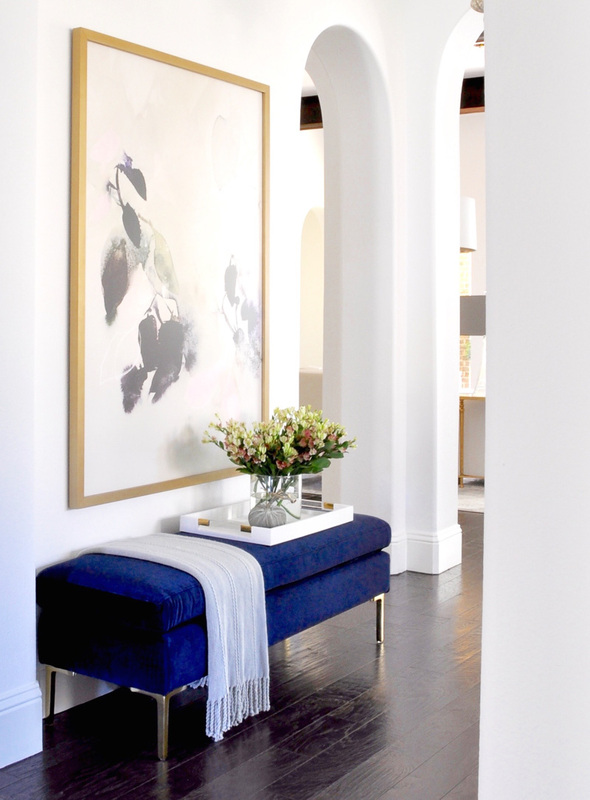 My blue velvet bench is a piece that adds personality to my home. It could easily work in several spots in my home. I truly love white. 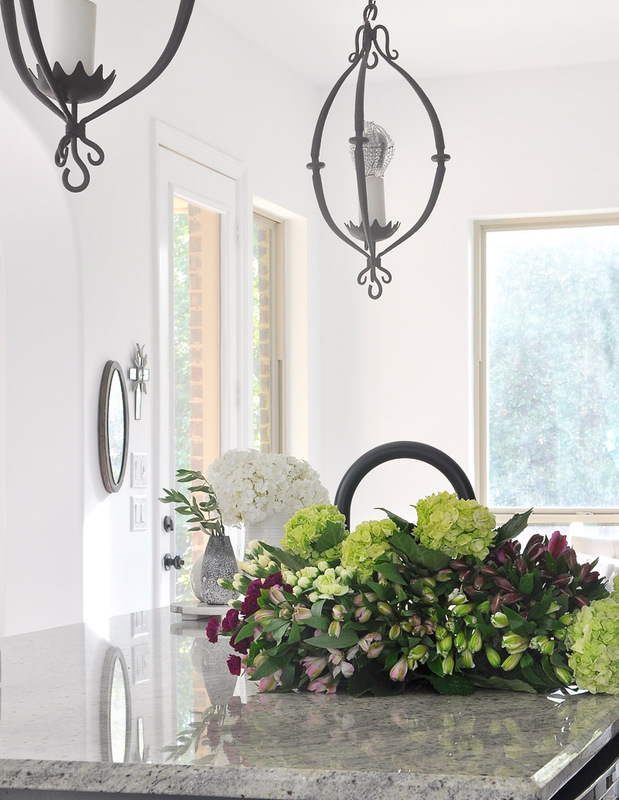 But, one of the main reasons is with a white home, a beautiful pop of color stands out like a welcomed surprise. It will be up to you to translate what matches your personality. But, when you figure out which pieces make you smile, even after you’ve had them for years, you’ll know. I love fresh flowers! They add a bit of happiness to each room. I also buy flowering plants. Orchids are my go to for their nodding heads and delicate flower. Dollar for dollar they are your Best Buy. the clear glass vase with the gold band. They are stunning!!. Great post and wonderful photos! Lovely! Kiss!